Today was the last day of the third edition of LLF-15 -- and it is time to celebrate English shair-o-shairy (poetry). Of course, we already have English ghazal, so taking the realm of poetry to new desi heights a large crowd was drawn to the session, where Pakistani-American poet Shadab Zeest Hashmi, Bengali-British poet Ahsan Akbar and Bengali businesswoman and poet Sadaf Saaz Siddiqi were presented on the stage. There were poets like Zulfiqar Ghose and Kishwar Naheed in the audience so Shahab introduced herself first that when she was in Kinnaird College, her book was published and she went for higher studies to California and now she is teaching poetry in US. After that sadaf saaz got introduced herself that grown up in Cambridge and she moved Chittagong at the age of 16 and now she is working as leading garment exporter and festival director of Hay Festival of Literature and the Arts. After that Ahsan Akbar introduced himself that he lives in Britain and he feels himself Bengali from the core of his heart and now the audience know about that celebrities so the show can begin with shair o shari. Now it was time for Shahdab to take step to speak up. She started off with ‘Bilingual’. She said that I break your fountain pen/wipe off the ink on your curtains/and with the celerity of a djinn/climb the roof. She also narrated other poems named ‘It’s a Marmalade House’, ‘Writing to My Maker’, ‘Ghazal – Broken Sky’, ‘Jinnah’, ‘Rant’, ‘Bakers of Tarif’, ‘Call to Prayers’, and ‘Passing Through Peshawar’. The poem she has written named ‘Writing to My Maker from the Café between Afghanistan and Pakistan’ about her visit of torkham Border, when she was kid and she visited in her childhood. She also narrated poem Broken by audience request. Sadaf Saaz started with ‘Sari Reams’ followed by ‘Mixing and Mingling’, ‘Silencing’, ‘Women of the Night’, and ‘Nation’. 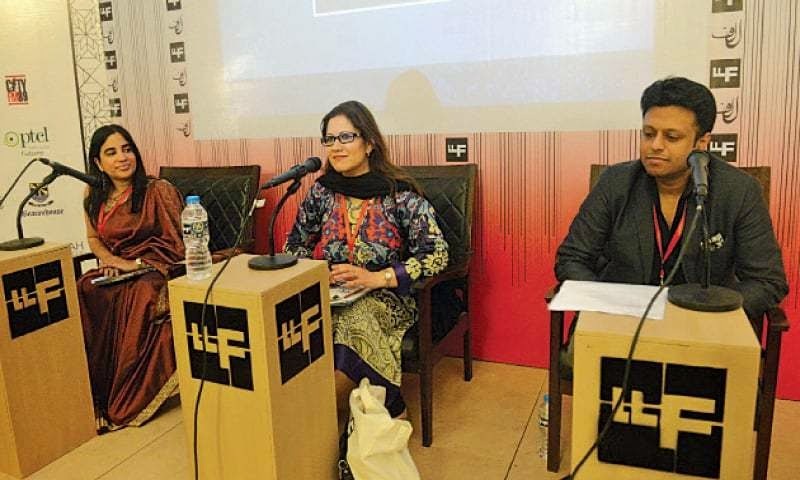 She also been part of LLF in 2014 and also said that they are doing great job by giving opportunity to the celebrities regarding their discussion, debate, diversity and tolerance, which has become important now. In the last ahsan came to end up the discussion with ‘A Song for Lahore ‘and it was nicely ended.